First Bus has been commended for its role as the principal partner in Bristol’s year as European Green Capital. Bristol is to pilot new hybrid buses thanks to a £1m grant from the Government to coincide with the city’s year as European Green Capital. 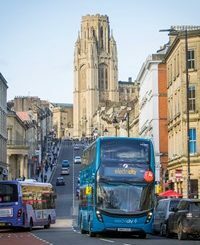 National Express has launched a brand new coach service from The University of Bristol to London. The coaches run directly from the University’s Stoke Bishop campus which houses 2,500 freshers. First West of England is trialling state-of-the-art cycle safety technology on three of its buses on the busy Gloucester Road corridor in Bristol. The Bristol MetroBus service is likely to use single-decker hybrid vehicles, with two sets of doors in an effort to minimise stop dwell time, The Bristol Post reported.